Water Street in the Financial District is a pedestrian wasteland. The BID aims to change that with a retail makeover. 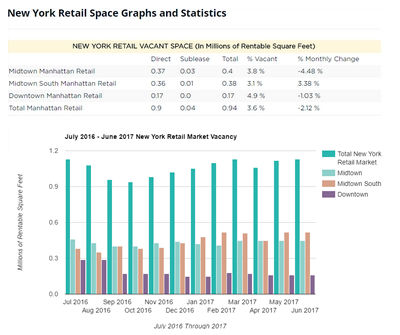 A re-zoning could make way for 167,357 square feet of new retail space, most of which would be built into existing arcade space on the ground floors of various buildings. It is essential to the revitalization of Lower Manhattan. 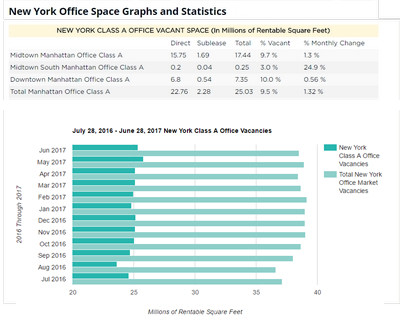 The top 25 office tenants in Manhattan take up more than 56 million square feet of space, with JPMorgan Chase occupying 4.67 million square feet and Citigroup, occupying 4.49 million square feet. The City of New York occupies 7.22 million square feet. Weinberg Properties plans to replace a single-story building located at 534 West 25th Street art gallery (Pace Gallery) in Chelsea with an eight-story building comprised of a mix of office and gallery space containing 48,761 square feet. 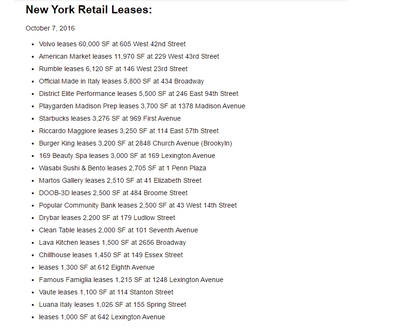 SL Green Realty">SL Green Realty has signed a 43,000 square foot lease with Nordstrom which will open at 3 Columbus Circle. The retailer is opening a free-standing menswear store on the basement, ground and second floors of the property, and could even bring a bar and other entertainment perks, too. 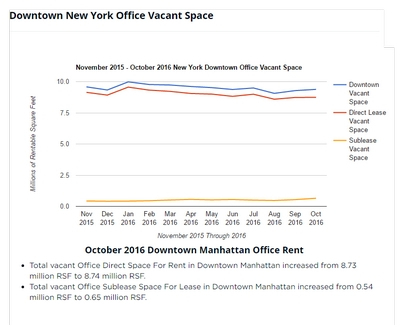 Hotels are rising at rapid rates across Downtown Manhattan. Some are calling it the city's biggest hotel boom ever with over 18,000 rooms since 2010, with another 36,000 rooms in the pipeline and 12,600 of those rooms currently under construction. 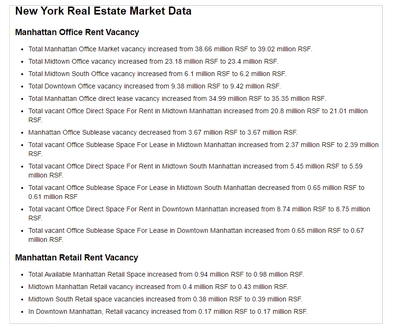 The majority of the building is occurring in the Financial District and Lower East Side. Last year InterContinental Hotels Group debuted the tallest Holiday Inn in the world, a 50-story, 492-room Holiday Inn Manhattan-Financial District at 99 Washington Street. It was followed by the Orchard Street Hotel at 163 Orchard Street, the Q&A Residential Hotel at 70 Pine Street and the Hotel Indigo at 171 Ludlow Street. Four properties that house carriage horses on the Far West Side could sell for a combined $70 million if the Mayor's plan to move the stables into Central Park goes through. The properties are located at: 618 West 52nd Street, 547 West 37th Street, 538 West 38th Street and 608 West 48th Street. De Blasio">De Blasio cut a deal to create a commercial stable near the 85th Street Traverse, and would prohibit pedicaps from operating below that. The three-story, 50,200-square-foot Clinton Stable at 618 West 52nd Street could sell for $25 million or more. 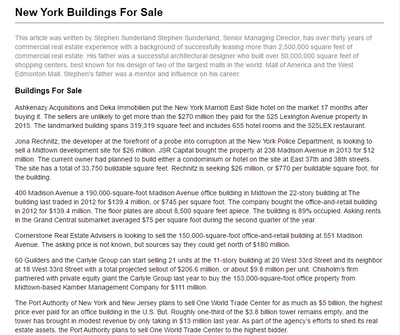 Two other properties, roughly 25 feet by 100 feet, are located right in the up and coming Hudson Yards neighborhood and could go for $17.5 million each. Commercial zoning for Hudson Yards would allow 21.6 times the lot size, or 40,000 square feet for each property. The final property, the Chateau, is between 11th Avenue and the West Side Highway and is zoned for manufacturing. The 12,500-square-foot property could sell for $6 million and hold a five- to six-story commercial building. The New York Botanical Garden is getting in on the action in the Bronx, having issued a request for proposals for a mixed-use development site located adjacent to the landmark institution. The property is on the southeast corner of Webster Avenue and Bedford Park Boulevard, one block from the New York Botanical Garden's entrance. The site can accommodate roughly 300 residential units, a 125-room hotel and about 12,000 square feet of retail. The Botanical Garden owns the acre-plus property. The site which is currently occupied by a supermarket, a parking lot and a laundromat is made possible by the 2011 rezoning of an 80-block area in the Bronx, which was intended to spur residential development in areas previously zoned for commercial. 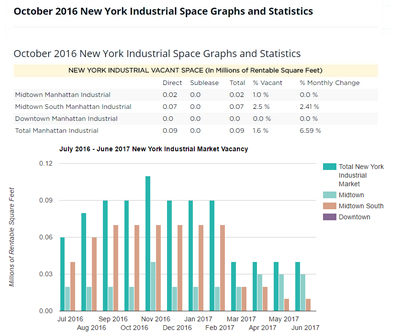 The two largest projects to kick off construction in the past year were just two blocks from each other near the Hudson Yards. A 68-story office tower from the Related Cos. at 500 West 33rd Street, part of the Hudson Yards redevelopment project, was the largest project to officially begin construction in 2015. When it comes to the Port Authority Bus Terminal in Midtown, retail might be the answer. Work on a makeover of the much-derided bus depot that will look to re-tenant 150,000 square feet of retail at the property and add another 13,000 square feet along Ninth Avenue. The sheer volume of foot traffic provides an opportunity not only to reposition the terminal and give it a long-overdue facelift, but also boost its appeal to both retail tenants and the general public. The former Fulton Street Fish Market is a graveyard for development plans. All the proposals have been abandoned, leaving the site's future ambiguous. The developer who controls the South Street Seaport through a lease with a city plans to develop or renovate 448,000 gross square feet in the area. 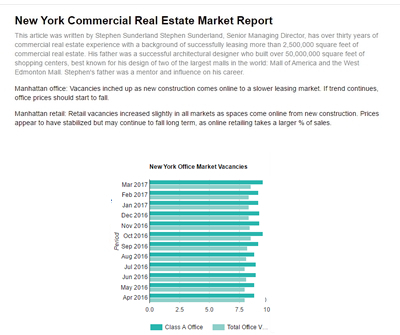 Tribeca Associates">Tribeca Associates is in contract to acquire the leasehold on the 47-story office tower at 30 Broad Street in a deal valued at around $130 million. The Tribeca-based developer will take control of the nearly 477,000-square-foot Financial District property from a partnership led by Gotham Realty Holdings. 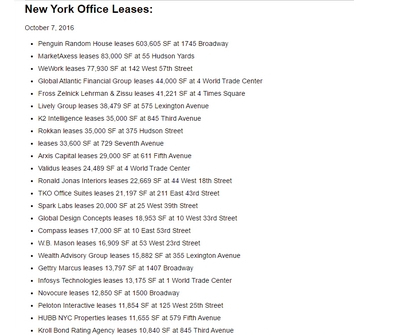 The leasehold runs through 2079, with Tribeca Associates paying $2.7 million in annual rent to the estate of the late developer Sol Goldman, which owns the property, through 2035. Hotel Developer Paul Kanavos has filed plans to bring a 146-key hotel to the corner of Broadway and West 28th Street. He nabbed the site last year for $100 million. 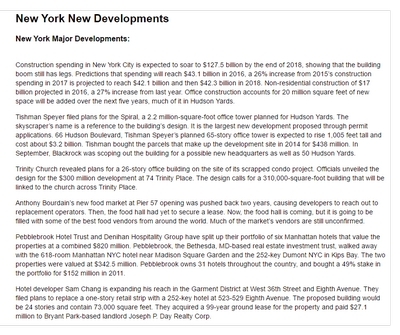 The new 40-story building, at 1185 Broadway, would comprise of a total of 153,199 square feet plus 11,190 square feet of commercial space. At 580 feet tall, the hotel would be one of the tallest buildings in the immediate area. The city's last single-screen movie theater is calling it quits. The struggling Ziegfeld Theater at 141 West 54th Street will close its doors in the next couple of weeks to make way for its latest incarnation: The Ziegfeld Ballroom. The 21,331-square-foot space will host galas and corporate events after it undergoes a severe renovation. The partners inked a 20-year lease at the space. New York REIT is moving to sell its leasehold interest in the Viceroy New York hotel, two years after buying it for $148.5 million, or $618,000 a key. The property can be delivered completely unencumbered by the Viceroy brand, meaning a new investor could hire a third-party manager to operate and rebrand the property. RXR Reaxlty is planning to add 50,000 square feet of retail at the Starrett-Lehigh Building in order to provide amenities for office tenants in need of shopping and food options on the ever changing Far West Side. The landlord is planning a space swap with Verizon to free up the full block front along 11th Avenue between West 26th and West 27th Streets. The Lightstone Group secured $330 million in financing for the conversion of a 16-story Times Square office building into a new hotel, a Marriott Moxy Hotel at 485 Seventh Avenue. The firm acquired the 235,000-square-foot Garment District office building, located between West 36th and West 37th streets, from the Eretz Group for $182 million in 2014. Developers are increasingly turning to smaller scale projects to lure big spenders. 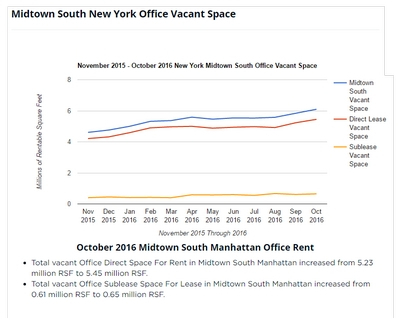 Boutique office buildings are currently in demand, partially because they are easy to fund and do not require a major anchor tenant. The buildings, which are typically smaller than 200,000 square feet, usually cost $100 million or less to build and can fetch annual rents of above $100 per square foot. Hotelier Sam Chang is planning a new 22-story, 162-key hotel in Midtown at 9 East 38th Street, between Fifth and Madison avenues, that would span more than 66,000 square feet. The existing structure is a 12-story office building. 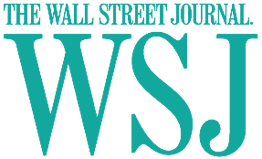 The two firms acquired the building and an adjacent property from Yeshiva University for a combined $29 million in 2013. Whole Foods is in talks with the developer to potentially set up shop at One Wall Street. If done, the deal would mark another milestone in the Financial District's development into a residential, family-oriented area. Sony will be moving more than just its corporate headquarters out of 550 Madison Avenue in Midtown. The electronics company is set to close its retail store at the base of the 36-story Midtown office-turned-luxury-condominium tower. 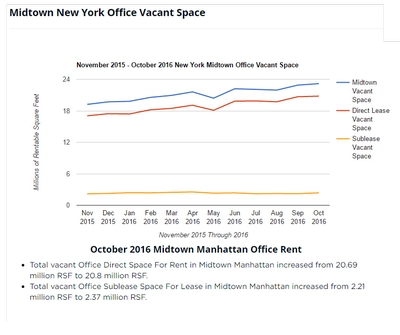 The company will vacate more than 25,000 square feet at the base of 550 Madison Avenue, located between East 55th and East 56th streets, where it has operated for nearly 22 years. Gary Barnett struck a pair of deals that will allow him to move forward with plans to develop another building near his International Gem Tower in the Diamond District. He will take control of a pair of properties at the northwest corner of Fifth Avenue and 46th Street nearby where Barnett has spent the past few years assembling properties and cutting deals to pave way for a new tower. The Nederlander Organization, which owns nine Broadway theaters, is embarking on a $2 billion project in Times Square that will create a one-of-a-kind retail space. The organization plans to lift the famed Palace Theatre 29 feet, creating space for subgrade retail. The Palace will undergo a multimillion-dollar restoration. The leases could potentially create a billion dollars worth of value over time. The North Lawn Building, which housed critical United Nations operations during the complex's $2.2 billion renovation, is set to be demolished. The nearly-windowless steel and concrete structure, located along 46th and 47th streets on the Far East Side of Manhattan, will be taken down over the next few months, after just six year in existence. After undergoing a $500 million renovation, the Javits Center may be getting another makeover to the tune of $1 billion. There are also plans to expand the center by 1.2 million square feet.